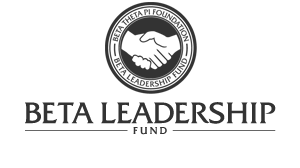 The purpose of the Beta Leadership Fund is to provide the financial resources that staff and operate the Men of Principle initiative, the Fraternity's award-winning leadership programs, the educational Foundation and important alumni outreach activities. More than 300 on campus chapter visits by our staff of leadership consultants. 2,000+ leadership program scholarships to our cutting-edge programs. Grants for the re/colonization efforts for eight new campus expansions. $500 Men of Principle Scholarships to every chapter for use in recruitment. 80+ Merit Scholarships totaling roughly $80,000 in tuition assistance. Coaching and training to Betas 1,500+ volunteers at the local level. The Foundation Board and staff monitors the fundraising and spending performance of the Beta Foundation relative to non-profit industry benchmarks which are calculated annual by members of the North-American Interfraternity Conference Foundation using public non-profit IRS 990 reports. We are committed to raising and spending your charitable dollars efficiently and in a manner that directly impacts young men of principle across North America. A complete summary of the Beta Foundation’s fundraising efficiency and program support is located here. Thousands of Beta alumni, sweethearts, parents, Friends of Beta and even undergraduates support the BLF annually. To see who has made a gift to the BLF this fiscal year, click here.